TACOMA, WA--(Marketwire - October 14, 2010) - Developed Europe has shown a steep increase in correlation over the past two years with the United States as the Russell Developed Europe Index has reflected a 0.91 correlation to the U.S. broad-market Russell 3000® Index. 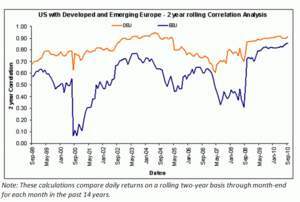 This high correlation continues the trend from 1996, as the Russell 3000 reflected an average correlation of 0.82 with the Russell Developed Europe Index during that time. As for Emerging Europe, the Russell Emerging Europe Index has fluctuated in correlation with the United States with an average correlation of 0.63. However, since 2008 the Russell Emerging Europe Index has reacted very similarly to Developed Europe, seeing a steeper increase in correlation to the Russell 3000 to 0.86.